Facebook launched Facebook Sports Stadium with Football ahead of Super Bowl 50. Facebook Sports Stadium is dedicated place to experience sports in real-time with your friends and the world. With 650 million sports fans, Facebook compares itself to the world’s largest stadium. With Facebook Sports, all the content on Facebook related to the game is in one place, and it comes in real time and appears chronologically. You can see posts from your friends, and their comments on plays, posts and commentary from experts, like teams, leagues and journalists, with easy access to their Pages, live scores, stats and a play-by-play and game info, like where to find the game on TV. You can get to Facebook Sports by searching for the game, and we’ll surface new ways to get there as the product evolves. Facebook Sports Stadium is available only for American football games on iPhone in the US. Other sports, platforms and countries will be rolled out in the coming weeks. Super Bowl 50 is on Feb. 7 and it makes sense for Facebook to launch Sports Stadium now. 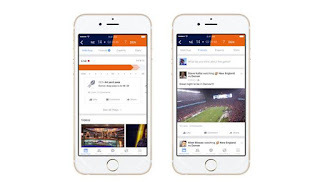 Last year Facebook launched a special feature for the Super Bowl, that appears to share most capabilities of Facebook Sports Stadium. The Super Bowl is this year in Facebook's backyard. I would not be surprised to see a Facebook Super Bowl 50 Ad. Find out which Super Bowl 50 Ads will be airing during the Big Game in 2016. Read the latest Super Bowl 50 News.